In the most recent survey for Winning the Issues (July 5-6, 1000 registered voters), we updated the list of issues and news stories in how they are driving voting decisions for next year’s mid-term elections. The chart below shows how each item was ranked on Election Day, in March, and this week. Economy/jobs remains the most important issue on the list, which is consistent with what we observed on Election Day and back in March. The issue that continues to be a close second on the list is need to get things done in Washington and get the parties to work together. 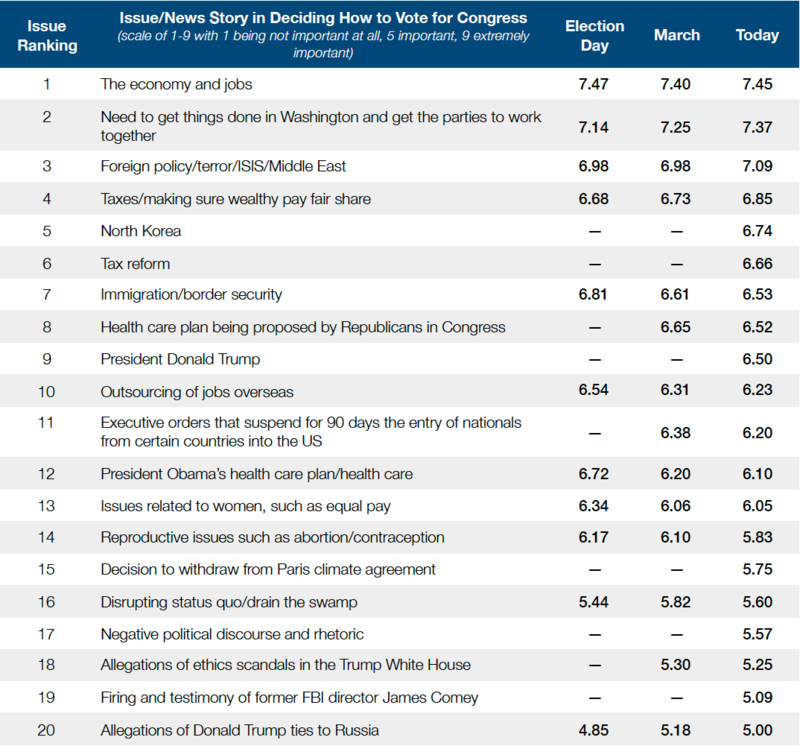 Foreign policy (#3 and #5 on the list) and tax issues (#4 and #6) continue to be significant factors in voting decisions. However, news stories being heavily covered by the media – including stories about White House ethics scandals (#18) and allegations of Trump ties to Russia (#20) – are lesser priorities in voting decisions at the moment. As shown in these results over time, the electorate is remarkably consistent in their priorities. “This reflects his campaign’s understanding of the obvious — that his high unfavorability rating is unsustainable in the general election,” said David Winston, who served as Newt Gingrich’s pollster for the former House Speaker’s 2012 presidential run. …And an April poll from Gallup found that 70 percent of women view Trump unfavorably, with only 23 percent saying they had a positive view of him. Over the course of the next several weeks, there will be many national and state surveys released. In order to help people make sense of this data, we have compiled party identification and ideology results from exit polls in recent elections. Exit polls are a unique set of numbers, as they are the only major dataset that is directly weighted to election results. That unique quality gives them the reputation of being the “official record” of what happened in an election. When evaluating a poll, it’s important to take partisan breakdown into account. A survey that dramatically overstates the number of Republicans or Democrats likely to turn out may not give an accurate read on public opinion among the true electorate. For example, the margin between Democrats and Republicans was at its largest since 1984 during the 2008 election. That year, the number of Democrats was larger than the number of Republicans by 7 points — quite a change from 2004 when things were even. The partisan breakdown in Midterm election years is always different from presidential elections, but we include them in our national data here for historical reference. Ideological makeup is also important. Often, the words “center-right” are used to describe the American electorate. This chart reflects that, as moderates have generally comprised the largest group, with conservatives significantly outnumbering liberals. As a resource, we have compiled breakdowns by party identification and ideology for the period 1984-2008 at the national level and across the previous four general elections (1996-2008) for the 50 states and the District of Columbia. That information is available on our website, here. We hope this will provide the public with a metric for evaluating polls as they’re released between now and Nov. 6. National Review Online’s Brian Bolduc posted a short piece on the release of our 2010 election analysis. According to the group’s post-election survey, both President Obama’s and congressional Republicans’ electoral strategies worked: The president goaded liberals into turning out, and Republicans convinced independents to join conservatives down the ballot.